Even by his standards, Stephen Curry was astonishing Monday. A week earlier, Seattle basketball fans were astonished too, in the opposite way. How long can each go on? 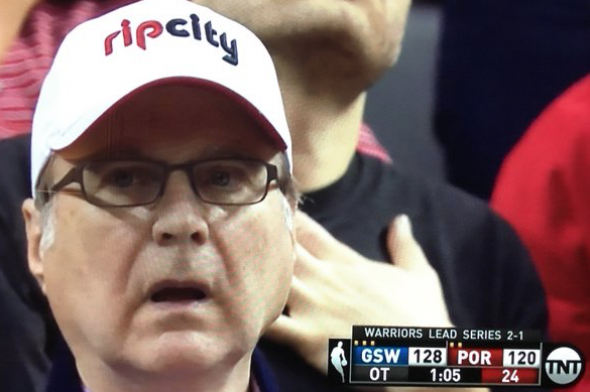 Paul Allen, watching Stephen Curry in overtime as he watched the Patriots’ Malcolm Butler in the Super Bowl. Less than 12 hours later, Curry was named Tuesday the NBA’s MVP, the first unanimous selection in the award’s history. After almost three weeks of injury absence, Curry dropped 40 on the Blazers, 10 more than his season average in a game he didn’t start, in which he was supposed to ease back with 25 minutes or so. Curry also had nine rebounds and eight assists. So the screen grab of Allen’s face became the instant internet meme that said everything without words. The Blazers were valiant, having won game three at home Saturday to cut the Warriors’ series lead to 2-1, then going up 16 in the first quarter Monday. But Curry came in, missed his first nine threes to get his range-finder re-calibrated, then went thermonuclear. The most any player scored in an NBA OT period, regular season or playoffs, was 13, by the Blazers’ Clyde Drexler a quarter century ago. The Blazers, a solid defensive team, knew the ball was going to Curry but swatted helplessly at him like kittens reaching for a Christmas ornament that’s too far away. From a Seattle perspective, the look on Allen’s face was identical to the one he had in Phoenix 15 months earlier when his Seahawks were on the edge of a second consecutive Super Bowl when The Play That Cannot Be Unseen happened. In making that connection, The Washington Post concluded, “poor Paul Allen,” a phrase believed to be a first in the 30 years since Microsoft became a public company. Or maybe the Post’s owner, Jeff Bezos, ordered a sarcastic shot taken at his fellow Seattle billionaire. While there’s no need for a pity party for the wealthiest owner, by a factor of at least two, in the NFL and NBA, it is possible, by taking a step back, for Seattle fans to bathe in cruel irony. A week earlier in an opening-round series, Allen was exuberant after his Blazers took down the Los Angeles Clippers, owned by another Seattle billionaire, Steve Ballmer (as you know, billionaires are to Seattle as poodles are to Beverly Hills — everywhere). The Clippers blew out the Blazers in the first two games, only to have Portland sweep the next four for the right to step into the Curry tidal wave. The irony is that two Microsoft-grown guys had to leave Seattle to get their fix of the NBA. Seattle has been out of the game for eight years and is in no immediate prospect of returning. There is no direct connection between the narratives, but the fact that Allen and Ballmer have playoff teams operating in the apex of the basketball calendar, while at the same time Seattle continues to spit up on itself trying to get back in, is painfully remarkable. After Microsoft went public in 1986, making Allen wealthy, he quietly inquired about purchasing the Sonics from then-owner Barry Ackerley to satisfy Allen’s hoops jones from childhood. Spurned, Allen went to the next closest team, in Portland, and bought the Blazers in 1988 from California real estate developer Larry Weinberg for $70 million. He also helped fund the construction of the Rose Garden, now Moda Center, which opened the same year, 1995, as the KeyArena remodel. The Portland building remains a quality pro hoops venue; the Key is not, nor can it be remodeled again into one. Ballmer is the same sort of hoops hound as Allen, but his day job as boss of the Redmond computer shop kept him from owning a team, although he did offer $150 million in a failed effort in 2008 to keep the Sonics from moving to Oklahoma City. In 2013, Ballmer was the biggest part of an effort led by investor and Seattle native Chris Hansen to poach the Kings from Sacramento for a proposed new arena in Sodo. But when the NBA told Hansen/Ballmer to drop dead, Ballmer bolted from the partnership to buy the Clippers from Donald Sterling, a loathsome character who was ousted from his ownership not long after Ballmer was ousted from Microsoft. The timing was perfect for Ballmer. The timing has never been right for getting Seattle back in the NBA, which continues to look upon the market the way a dog views a skunk after having been sprayed. Hansen may still have an arena play left until his five-year deal with the city runs out in November 2017. If not, there are other wealthies who may be contemplating something different. But after a no vote by the Seattle City Council last week on an issue critical to the creation of the arena in Sodo, the return of the NBA is nearly dead, and interest by the NHL as a winter sports alternative is not visible. So the basketball question arises this week as to what is more difficult: Stopping Steph Curry or starting Seattle. I vote for Seattle, because Curry will age. Seattle can go forever this way. Unless of course, the local poodles become sled dogs, and pull this arena idea away from municipal participation. One more irony: The president of the Golden State Warriors is Rick Welts, former Sonics ballboy and University of Washington graduate. Couldn’t find a brighter guy to ask to come home and run the show. It took me a couple of days to figure out how to recover from the City Council’s vote and the only conclusion I can arrive at is it is time to take the arena chase to the suburbs. To me, the SoDo location made the most sense for the most people around the Puget Sound region and transit-wise. But history tells us Seattle is incapable of making such a decision. Safeco had to be rammed through the state legislature (and I have heard Tim Eyman say a number of times that overturning of the “will of the people” is what got him interested in taking an active role in politics. Thanks Ms!). The Clink had to be approved via a state-wide ballot initiative, because I’m sure Paul Allen didn’t like his chances with the city. In any event, any further attention give to trying to build an arena in Seattle is fruitless. I think we should follow Paul and Steve’s lead and head out of town. It’s a subject I’m not going to give any more energy to. No legitimate study has shown that taxpayers funding a big stadium makes any financial sense. So as far as I see it, Seattle voters and the council are smart. It’s easy for you and me to make these comments since we’re not footing the whole bill. The politicos sure stumble over each other getting to the front of a championship parade though. And the voters love waving the 12 flags around town. I guess that’s part of the American tradition of wanting stuff but not having to pay for it. It took us almost 200 years to overcome the tradition of slavery. I’m not sure we have completely. Still seem to be fighting the civil war in many ways. All big cities have some similar problems funding arenas. LA, SF and OAK refuse. SAC said yes. SEA says no. I do understand why city politicians resent the leagues not paying 100 percent. Hansen’s deal is way more private than public, but any is too much for many. Not sure how using the city and county’s bonding capacity will take resources away from tiny house communities or needle exchange programs, or any other public service programs the city feels it needs (not said with sarcasm either btw). I get cities have to have a sense of priorities and I agree with a lot of that sentiment that the leagues should pay more. But it seems to me that that argument is debating past stadium or arena projects. Jeff Smulyan, Ken Behring, et. al are long gone. This debate was allowed to move away from the details and into the fog of ideology and history it seems. Art, I hear the sound of taps being played at a burial ceremony. Is that what this article implies? I certainly hope so. I need to keep my blood pressure from spiking like it does whenever this subject arises. Can’t know. Stuff happens. Things change. At the moment, there’s no place for the NBA. “my room mate Mary Is getting paid on the internet 98$/hr”..,……..!wc237ctwo days ago grey MacLaren P1 I bought after earning 18,512 DoIIars..it was my previous month’s payout..just a little over.17k DoIIars Last month..3-5 hours job a day…with weekly payouts..it’s realy the simplest. job I have ever Do.. I Joined This 7 months. ago. and now making over. hourly 87 DoIIars…Learn. More right Here !wc237:➽:➽:➽➽➽➽ http://GlobalSuperJobsReportsEmploymentsWhiteGetPayHourly$98…. .❖❖:❦❦:❖❖:❦❦:❖❖:❦❦:❖❖:❦❦:❖❖:❦❦:❖❖:❦❦:❖❖:❦❦:❖❖:❦❦:❖❖:❦❦:❖❖:❦❦:❖❖:❦❦::::::!wc237…….